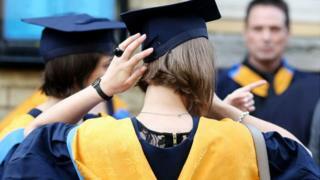 Students from the European Union starting university courses in the UK this autumn will have their student loans funding honoured, University Minister Jo Johnson has said. And those EU students who are already attending UK universities will continue to receive financial support. The Student Loans Company has sought to reassure students and applicants following the EU referendum. And Mr Johnson has tweeted: "UK welcomes EU students." "Current students and this autumn's applicants will continue to receive student finance for duration of their course," said the Twitter message from the minister. Universities have been seeking clarity about the implications of Brexit for their EU students, international exchanges and for funding from EU research projects. A statement from the Student Loans Company says that those EU students who are already studying in the UK will not face any changes to financial support, such as loans to cover tuition fees. The current arrangements will also remain in place for those who have applied and are expecting to begin university courses in the autumn. But the arrangements for EU students beginning courses in the following year - autumn 2017 - have still to be clarified. There are about 125,000 EU students in higher education in the UK, with Germany and France the biggest senders. But among those non-UK students starting university in the UK last year, there were more students from China than from all the EU countries put together. Following the vote to leave the EU, Wendy Piatt, director general of the Russell Group of universities, said that the Brexit decision "creates significant uncertainty" for higher education. She said that the Russell Group universities would seek assurances from the government that "staff and students currently working and studying at our universities can continue to do so after the UK negotiates leaving the EU". Universities have been particularly concerned about the future of EU research funding, with analysis by the Royal Society showing that the UK is one of the largest recipients. It suggests that between 2007 and 2013, the UK received 8.8bn euros (£7.3bn) in direct EU research funding and had contributed 5.4bn euros (£4.5bn). But there are examples, such as Norway and Switzerland, that are outside the EU but are able to contribute funds and have "associate country" status for EU research projects. These associate member countries do not have a say in how such research funding is directed.